Beaufort Mayor Rett Newton addresses the group at the beginning of the workshop. A team of five coastal organizations, both private and public, are working on a collaborative marine debris reduction plan for the North Carolina coast. To aid in the development of this process, the five groups— the North Carolina Coastal Federation, North Carolina Sea Grant, Onslow County Solid Waste, North Carolina Marine Debris Symposium and the North Carolina Coastal Reserve & National Estuarine Research Reserve — hosted a workshop on Feb. 8. The goal of the workshop was for participants to come up with strategies and actions that will be incorporated into the plan. The participants are expected to continue working on these strategies after the workshop in order to move the plan forward. 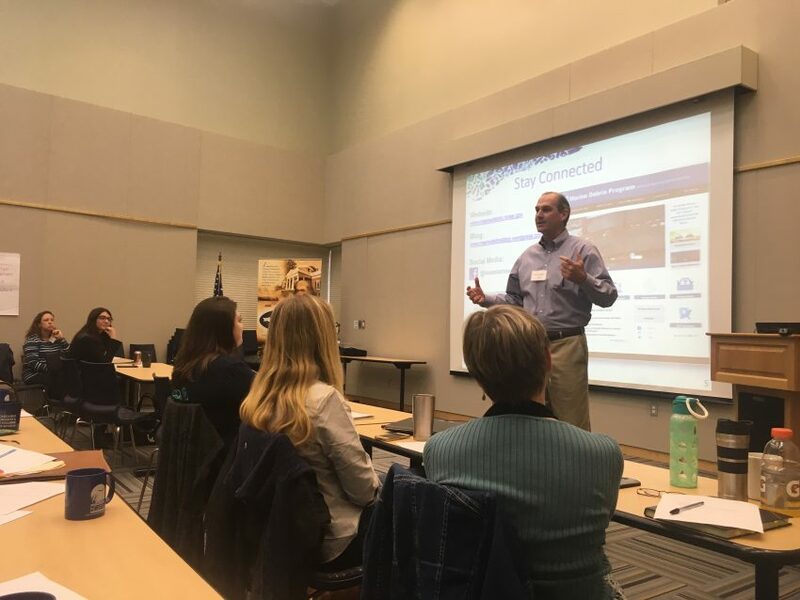 The workshop drew a crowd of 41 people from the host organizations as well as universities, municipalities, businesses and business groups, environmental organizations and state agencies. “The idea behind getting all of these stakeholders involved was to hear a variety of voices across many different groups, and their participation meant that they were committing to further development of the strategies they came up with,” said Sara Hallas, coastal education coordinator for the federation. The workshop opened with remarks from Sarah Latshaw, Southeast regional coordinator for the National Oceanic and Atmospheric Administration (NOAA) Marine Debris Program; Rett Newton, the mayor of Beaufort; and Adam Caldwell, regional representative for the office of Thom Tillis, U.S. Senator from North Carolina. Hallas gave the first presentation of the day on a marine debris assessment of prevention and removal efforts, which is in its final stages. The assessment was developed by the host organizations and includes information about why marine debris is a concern and outlines the major marine debris issues in the state. It also identifies organizations that are working on addressing marine debris and gives an overview of past projects. Two graduate students from Duke University Marine Lab will help complete the assessment by the end of spring. From there, the stakeholder team will develop the marine debris reduction plan. For the majority of the workshop, participants broke off into small groups of three to five people and completed a Strategic Doing™ plan, a planning outline that allows the group to identify what they will bring to the table in coming up with a strategy and how they can best use their skills in developing a strategy. “The idea behind Strategic Doing is that it provides a framework for loosely organized networks to work on complex issues and to get started on projects quickly,” said Gloria Putnam, coastal resources and communities specialist for North Carolina Sea Grant. Rachel Bisesi, coastal education coordinator for the federation, said this planning method draws on everyone’s strengths to come up with doable strategies to reduce marine debris. “The groups came up with action plans for the strategies they chose, and they will continue to meet every month in order to coming up with implementation plans for their strategies,” Bisesi said. These strategies will be included in the marine debris reduction plan. It will go through edits in late summer and early fall after receiving feedback from the stakeholder group. It will receive additional edits after the North Carolina Marine Debris Symposium. The plan is set to be finalized next winter. For more information about the federation’s ongoing marine debris work, and to stay updated on this plan, visit nccoast.org/marinedebris.